Before we left for our Nebraska and Singapore vacations I took Natalie to get a pedicure. We decided to do this new trend called trendy nails unlimited at the pedicure boutique. They are basically stickers you can put on your toes or fingernails to add some extra sassiness to your nails. Check them out here. I got the crowns for my toes and Natalie ended up getting just her big toes with the psychedelic nails. I loved them and think it is a cute idea. I think I'll get the zebras or plaid next. They are very addictive with all their different options. I'm not sure if I can get them in Singapore and I'll be wearing sandals ALOT more then I ever did in Utah. When we went to Nebraska we also visited the Omaha zoo and I lost one of my stickers. I thought I'd have to do without the sticker for the remainder of our vacation. However, when I was out with my sisters doing our traditional pedicures I got it replaced! But not with stickers! The lady hand painted the crowns on my toe and you can't tell the difference! It's my little toe here and it is an EXACT match. The ladies laughed so hard that I was putting stickers on my toes when all they had to do was paint it on. They really thought I was crazy. Then one of the ladies high fived my sister and said "Nebraska rules, we are better". It was hilarious. I know those ladies were making fun of me and my toes. 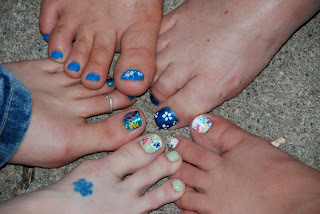 AND then they ended up painting cute decorations on everyone elses toes. Aren't we so cute? and mine are the only stickers! The bad mommy award goes to ME!